The newly announced Samsung Galaxy Tab 3 V, as well as the new Samsung Galaxy A7 is now available with Maxis from RM239 and RM799 respectively. 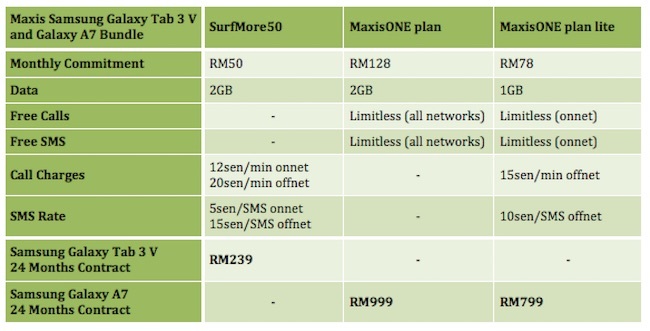 Maxis’ tablet bundle are usually tied to its data-centric SurfMore plans, but since the SurfMore75 plan has already been removed, you can only sign up for a SurfMore50 plan to get the tablet. As for the Galaxy A7, it is available for those of you who sign up for a MaxisONE postpaid plan. Made official just last week, the Samsung Galaxy Tab 3 V is an entry-level tablet from the Korean company. Retailing at RM499, it has a 7” display with a resolution of 1024 x 600, and is powered by a 1.3GHz quad-core processor with 1GB of RAM and 8GB of internal storage. Other specs include 2MP front and rear camera, microSD slot supports up to 32GB cards, and an extended battery life of up to 8 hours of video playback. 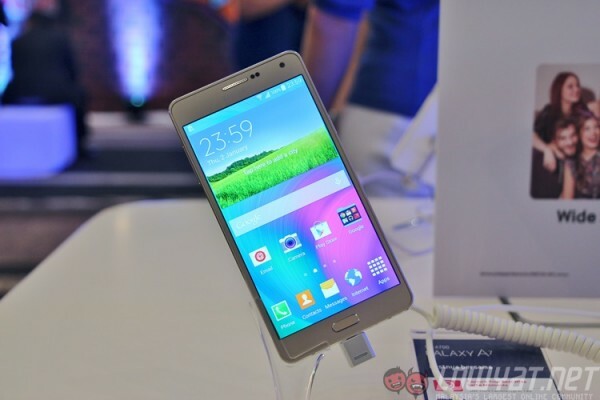 The Galaxy A7 on the other hand is an upper mid-range Android smartphone from the company that retails at RM1,499. Made out of a metal unibody, giving it a premium feel, it measures at only 6.3mm slim and packs some pretty good hardware under its 5.5” Full HD Super AMOLED display. The device is powered by a 1.5GHz octa-core Snapdragon 615 processor with 2GB of RAM and 16GB of internal storage. Other specs include 13MP rear camera, 5MP front camera, LTE, and has a 2,600mAh built-in battery. Find out more about the Samsung Galaxy Tab 3 V in our announcement post, or get an in-depth look at the Galaxy A7 in our hands on post. Visit Maxis for more information about its Galaxy Tab 3 V bundle or its Galaxy A7 bundle.